Derwent Valley Orienteers burst on to the orienteering scene in 1969 with a scurry of activity that would be impossible in these more ponderous times of accurate maps, fairness and standards. The inaugural meeting was held in January with 5 members present. Four weeks later the club had selected a design for their new badge and by early March the club had held its inaugural event on Matlock Moor. 4 weeks later the club held another event in Shining Cliff. In 1969, preparation for events was minimal. Permissions were obtained and a section of the 2 1/2 inch 0S map copied with a cursory nod in the direction of the Ordnance Survey. Someone then planned a course. Although planners were encouraged to use features on these OS maps for control site, this was not always practical. This led to the introduction of the indefinite article ‘a’ in the description list. Any control site prefixed ‘a’ was not on the map, those prefixed ‘the’ was the one shown on the map. Organisation and controlling was still in its infancy. At the club first event the planner was spotted on his way out in to the forest to place some of the controls as the first competitors started. Times for courses iii these early days tended to be long – not due to course lengths but more to do with the standard of the maps. By 1970 the club had 11 members attending the AGM, with a total club membership of around 20. “A sound financial statement ” for the year showed a surplus of £2 9s 2d. 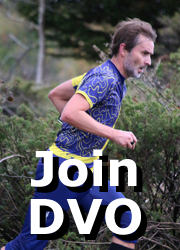 DVO staged the Jan Kjellstrom relays on a bitterly cold day in Shining Cliff. Robin Harvey had drawn the map for us – and it was John Disley who insisted that it was printed at 1:20,000 as this was an international event and this was the scale used for international events. Regular weekly training runs on Wednesday evenings were established in the same year, 1970, meeting at Jenny Tenant’s house, Blue Mountains, with training sessions in May in preparation for the big events in June. Since 1970, DVO have fielded a strong women’s team. In 1973 we presented the DVO Trophy for the Open Women’s event in the British Relays, and played our part in staging the event in Clipstone Forest. We also won the new trophy, which we have also received several times since. That summer 10 members of DVO also competed in the Swiss 5 day event with 16 month Zoe Wilkinson in tow. By 1974, the Buckley’s welcomed us to their first DVO dinner, a well supported event, which continued at their house for a further 15 years. 1975 brought the British Championships to Strines with DVO heavily committed, and by the following year our membership had climbed to 48. 1977 saw the inauguration of the Club Championships – a closed handicap event for the Chris Yardley Trophy which anyone favoured by the handicapper has a good chance of winning. Chris was the DVO Secretary for 2 years and was killed in an avalanche on Ben Nevis in the spring of 1977. 1979 was the club’s 10th anniversary and a replica of the first event was held. 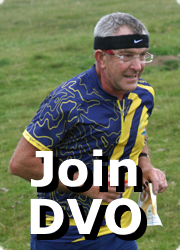 Membership had risen to 70 and DVO’s women’s team regained the DVO Relay Trophy (yes, we presented it and won it) at Swynnerton and retained it the following year when Roz Clayton’s dazzling run also won her the William Younger Trophy for the best individual run. 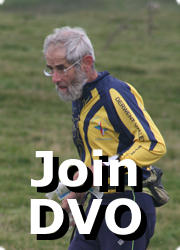 1982 found DVO fully committed to the British Championships in Shining Cliff and Crich, planning, organising and bridge building. There were 2,000 entries compared with 800 in Strines in 1975. Zoe Wilkinson was chalking up victories in the W 1 0 class. With the bracken high in Shining Cliff, Roz Clayton won the Club Championships. 1983 saw an attempt to break the record for running the length of Offa’s Dyke; we didn’t. In 1984 we made our first innocent appearance in the CompassSport Cup – since then we have deployed our strength in the way most likely to achieve results. The club newsletter “Newstrack” was launched and we bought a club tent which provided shelter for competitors and their families and a focus for the Club at large events. 1984 also saw Roz Clayton travel to Australia and win the Australian Championships. 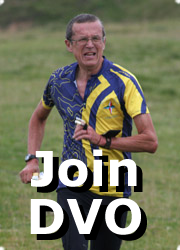 In June 1985 DVO arranged the Derbyshire Round Relay. It started at the top of Thorpe Cloud at 7am and finished some 88 miles later at Derby Cathedral – DVO fielded 2 teams, 40 runners! We came 2nd and last! At the 1985 AGM it was agreed to introduce the ‘Club only’ membership, now called ‘Introductory membership’ to allow people new to orienteering to receive details of local events through Newstrack, hopefully providing a stepping stone to ‘Full’ membership at a later date. A Fixtures Sub-committee was also formed, but business meetings were no shorter. In 1986, DVO used Chatsworth for the first time – it poured with rain but the Duke of Devonshire refused the shelter of an umbrella and presented prizes to a smattering of DVO as though it was a real pleasure. Full marks to the Duke! 1986 was also memorable because DVO fought its way to the final of the CompassSport Cup, and by just beating AIRE and South Yorkshire we won a handsome trophy that goes with being TOP CLUB. We were also delighted to receive two blue cube frame tents as prizes. 1987 saw us travel to Witherslack to defend our trophy. This we did despite the rain this time beating SYO, Happy Herts and Edinburgh Southern in the final. A bit of quick negotiation changed our prize of 2 additional blue cube tents to a larger finish tent. 1988 saw DVO again organising a long distance footpath relay, This time it was based around the White Cross Way using Ambergate as a base. One of the founder members of DVO also left the area in 1988. Jenny Tennant left Derbyshire for the south. Jenny’s house on Blue Mountains was used as the base for training runs for a number of years in the 70’s. Jenny was also planner for the Women’s Relay for the World Championships when they were held in Inverness in 1976. DVO also fielded 3 teams in the Harvester Trophy, one of them an all women’s team. Unfortunately DVO had to hand over the Compass Sport Cup to SYO, although we again reached the final for the fourth year in succession. By 1989 DVO introduced a planning competition for DVO members and also saw Eyam Moor used for a badge event in the Autumn. While 1990 saw Chatsworth used again for another badge event. It is believed that the string course may well have had a record entry with around 150 participants. 1991 saw us organising the JK in association with the rest of EMOA. Shining Cliff and Crich Chase were used for one of the days which resulted in many complex negotiations on bridge building, but eventually resulted in Tony Berwick’s bridge which successfully saw all the competitors across the Cromford canal, as well as the A6, River Derwent and Matlock to Derby railway (on more established bridges and crossings). 1993 saw DVO co-host Spring in the Peak with MDOC. A weekend’s orienteering was Provided by linking Chatsworth badge event with Crowden badge event. Both Kim Buckley and David Godfree were selected for GB at the Junior World Champs in Italy. In 1994 DVO celebrated the Silver Jubilee by holding a special dinner at the Devonshire Arms in Beeley. A 25th anniversary event was also hold in Shining Cliff woods using the original map. And boy was that tough, everyone who finished deserved a medal! This year DVO provided 25% of the Junior World Champs team bound for Poland, Kim Buckley, Alastair Buckley and David Godfree. 1995 saw Steve Kimberley introduce Bole Hill as a new area for the Club Champs. Kim Buckley was selected for the British Squad for the Junior World Champs in Denmark. 1996 saw several members competing in a Swiss 6 day. With mark 2 of the T-shirt. Graham Johnson, in his quest to rid himself of constant nominations for Sports Personality of the Month exhorted the club “Do something thick in ’96”. However, Graham does still maintain a habit of winning this prestigious award. Also in February 96 we found that courses in Crich Chase had to be replanned due to “anticipated hostilities” from the IRA (Severn Trent concerned about the reservoir). Kim Buckley again selected for the Junior World Championships, this tine in Rumania (and also for the World Students Champs in Hungary). 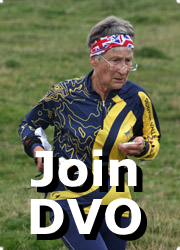 1997 saw DVO involved in organising the British Championships weekend. NOC’s Clumber Park was used for the individual and Chatsworth was successfully used to stage the British Relays. Chris Godfree represented Britain at the Junior World Championships in Belgium. In 1999 DVO won the lottery, or at least received a grant towards instructional videos, books and other coaching materials. It also covered coaching fees and computer hardware and software. 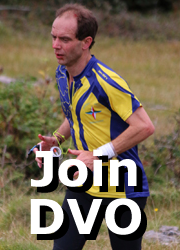 DVO was also heavily involved in the organisation of the World Champs in Scotland. Roles included car parking, stewarding, security, drinks and team tents. It was also possible to watch ex-DVO member Kim Buckley finish 21″ in the Classic Race. In 2000 DVO has continued to thrive. There has been more emphasis on ensuring that permanent courses are available and that more coaching is available to schools and juniors in particular. The above is thanks to an unknown source. A nationwide outbreak of foot and mouth disease caused the cancellation of most forest orienteering events in the first half of 2001. DVO filled the gap by staging a series of urban events held in Derby, Chesterfield and Ilkeston. Kim Buckley was again selected to take part in the World Championships in Finland. On September 23rd the first DVO open event using the SportIdent electronic punching system was held at Cromford Moor. DVO were awarded 3rd place in the Sports Club of the Year competition organised by the Foundation for Sport and the Arts, who commended our commitment to development of the sport and to taking orienteering into schools and other groups. In June 2002 we organised orienteering courses as part of the Derbyshire Adventure Youth Games held at Carsington Reservoir. 600 children took part. In 2003 DVO staged the Midlands Championships at Chatsworth. Our W165 relay team won their class at the JK, which was to be the first of five consecutive wins for the squad made up of Liz Godfree, Pauline Ward, Jen Gale and Helen Finlayson. 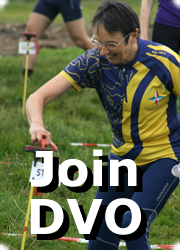 In 2004 DVO staged the British Night Championships at Crich Chase on February 28th. 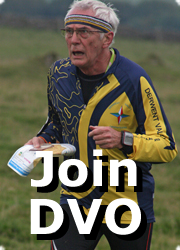 Although the JK was held in the Lake District, DVO had significant involvement on individual day 2 when courses were planned by Steve Buckley and John Duckworth and the starts were manned by DVO helpers. The DVO equipment store, which for many years had been kept in two sheds in Steve Buckley’s garden, was relocated to new premises on railway land near Ambergate. DVO staged the British Schools Score Championships at Shipley Park on October 8th 2005, with 360 children competing. In 2006 Val Johnson was appointed as a part-time Community Sports Coach for Derbyshire, responsible for delivering coaching activities both in schools and within the club. Pauline Ward won the W60L class at the British Championships. The colour-coded event at Carsington on February 19th was the first to provide pre-marked maps for all courses : this proved a successful innovation and led to the rapid demise of the master-map system. On May 13th a colour-coded event was staged in a new area we called Riber Hillside, although parts of the area had previously featured on the Lea Woods map. On Feb 11th 2007 DVO staged a colour-coded event at Haddon-Lindop, which was the first time in 30 years we had gained permission to use this area. The major event of the year was the National Event held at Longshaw on December 3rd. In 2008 DVO volunteers assisted with planting of new trees in Littlemoor Wood (which is part of Riber Hillside) as part of a Woodland Regeneration Project instigated by Paul Wright and managed by Tony Berwick. Liz Godfree won the W60 sprint event at the World Masters Championships in Portugal. An initiative to set up satellite clubs in Buxton, Chesterfield and Matlock got underway and an event organised by the Buxton satellite club in September attracted 150 entries. The 40th Anniversary score event was held at Riber Hillside on June 6th 2009. The DVO 40th Anniversary dinner was held at Wirksworth Town Hall on October 3rd when we were delighted to meet several stalwarts no longer living in the area, including Steve and Margaret Buckley, Roger and Debbie Wilkinson, Jenny Tennant, and Alan and Jenny Shaw. The Veteran Home International Relays were staged at Longshaw on November 14th and the individual race at Eyam Moor on the following day. In 2010 a new team structure for helpers at events was introduced, with specialist teams for start, results, parking/registration and string courses. The Chesterfield satellite club was established. At the British Sprint Championships Liz Godfree won W55 and Doug Dickinson won M65, and Sal Chaffey won W45 at the British Championships. In October 2011 DVO staged the CompassSport Cup Final at Longshaw. The Matlock satellite club started regular Wednesday night sessions at The Arc leisure centre. In 2012 our W60 team of Liz Godfree, Pauline Ward and Judith Holt won their class at the British Relay Championships. The East Midlands Urban League became established and DVO members won 6 out of 10 classes : winners included Margaret Keeling, Liz Godfree, Helen Chiswell and Joanna Goodhead. A New Year’s Day score event was held at Wirksworth using a map drawn to the International Specification for Sprint Orienteering Maps (ISSOM). The club newsletter “Newstrack” became available in electronic form. 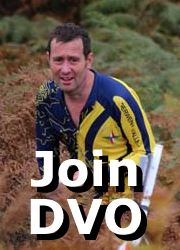 In 2013 DVO came 4th in the CompassSport cup final held in the Forest of Dean on October 20th. There were further relay class wins for the JK W165 team (Liz Godfree, Judith Holt and Sal Chaffey) and the British Relays W60 team (Liz Godfree, Judith Holt and Pauline Ward). The British Middle Distance Championships were staged at Stanton Moor on April 21st. The British Schools Championships were staged at Shipley Park and the class winners received a yard of Jaffa cakes, with a Toblerone cup-cake for the runners-up. Over 800 took part. 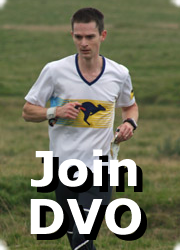 The DVO club championships were held on a new area at Longstone Moor. The permanent course posts at Ilam were equipped with QR code labels, allowing competitors to use mobile phones to time themselves around the course. The major event staged in 2014 was the Midlands Championships at Longshaw in October which attracted 669 entries. 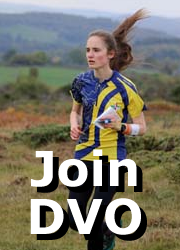 DVO also staged the first East Midlands Sprint Championships at Abbotsholme School, and the club championships used another new area at Birchen Edge. There was another success in the British Relays W60 class for Liz Godfree, Judith Holt and Viv Macdonald. Newstrack editor Sal Chaffey developed the use of colour in the newsletter : the first coloured cover was in March featuring the Robin Hood Trophy (won for the first time) but a more dramatic cover in September was a photo of Derek Gale, Graham Johnson and the Matterhorn. In 2015 there were wins at the British Championships for Dave Parkin in M80, Liz Godfree in W65 and Rachel Duckworth in W12A. Rachel also won her class at the British Sprint Championships. Further afield, Doug Dickinson was 3rd in the M70 class at the World Masters sprint race in Gothenburg. In September a colour-coded event was held at the new area of Chinley Churn in the High Peak, with views towards Manchester. At the Longshaw event on March 6th 2016, the new SIAC e-cards were available for competitors to hire for a trial of “contactless” punching. Following this successful trial, contactless punching was enabled at all subsequent open events. The DVO junior team reached the final of the Yvette Baker Trophy for the first time and gained valuable experience in finishing 11th out of 13. Helen Chiswell won W35 and Liz Godfree won W65 at the British Sprint Championships held at Queen Elizabeth Olympic Park. Liz Godfree also achieved 3rd place in W65 in the World Masters Championships Sprint held in Estonia. Judith Holt was appointed as Chair of British Orienteering.